Ad-blocker is an extension available on major browsers which blocks the advertisements which appear on Facebook / Google / Youtube and all small and big website/blogs. Ad-blocker currently has millions and millions of users. Bloggers work hard to provide services to their visitors and in return they too should get something and this extension is actually the road block in the path. Due to Ad-blocker the ads don't reach some of the visitors and thus there would be no money no matter how much large user base you have. So in order to block Ad-blocker users, you just have to add a small piece of code. When any Ad-blocker user visits to your blog he will be redirected to a page which will instruct him/her to disable the extension and visit the page again. There are many pros and cons of this plugins. 1. You will have more income as ads are visible to all. 2. After adding Ad-blocker the UI of the website changes to an extent. After adding this plugin all can see the actual page. 2. You may loose visitors. A bloggers main job is helping others and not making money so I would personally recommend not to use this plugin. But if you think that you are not getting anything for the things you have been providing to your visitors you may add this plugins. First go to Blog Title → Template → Edit HTML. Press Ctrl + F and search for </body> and paste the given code just above </body>. You are done now. Now whenever any Ad-blocker users come to your block he would be forced to disable the extension to see the contents of your blog. even if i not enable adblock the blog go to another page automatically ! 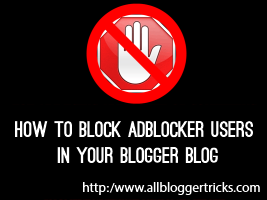 Here is the best solution to stop adblock for your blog to boost income.